I think we should move Easter to Autumn. I know it would stagger an international festival and detach it from Passover - but the symbolism would be better. Everyone knows fertilised eggs have chickens inside. Eggs were never dead, or even dormant, and it's not in the least bit surprising when a chick pops out. But take a look at this. 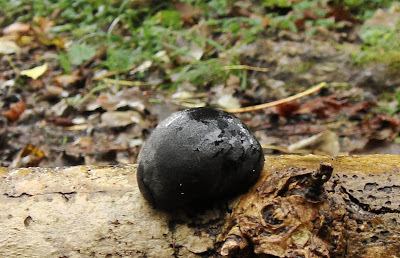 I don't know what it is but I found it on 14th November in woods near the River Stour at Blandford Forum in Dorset (about seventeen miles from Dorchester and twenty five miles from Weymouth). It was about the size of a burnt chestnut - and looked like one too! There were several stuck to a fallen . . . twig . . . branch . . . . . . what do you call something which is neither one nor the other but somewhere in between? I wasn't sure whether it was a canker, a parasite a . . . well, bear it in mind. 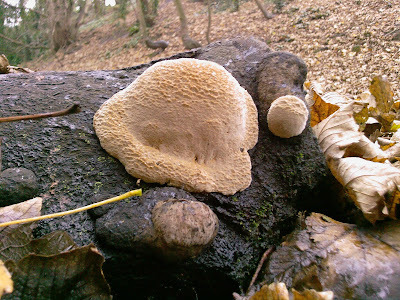 This is a fungus nearer home from 27th November last year. 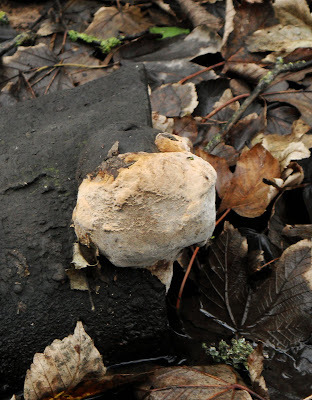 Continuing with my plan to be deliberately misleading rather risk a dangerous mis-identification, I've called it Slugus Fungus. To me, it's particularly strange because it seems to be shaped by gravity. See? It hung around for a long time, unappealing and desiccating. And, at some point, I'm not sure when, it became nothing but black lumps. I looked. I thought that was the end of it. But, look at this. Here we are on 25th November this year. (It's roughly two or three by three or four inches.) At the other end of the log, on the 28th November. And the new life on this log has been breaking out for a while. I don't know when it started but I have a photo from 30th October where some substantial 'bursting' has already happened. Now look again at the burnt chestnut thingy. I wish I knew what has happened to that one. It won't be where I saw it. It will have been moved by the wind, people or dogs. And, even if it's still there, I doubt I could find the place. And even if I could find the place, I'm not going for a three mile walk followed by an hour long bus ride followed by a two mile walk in the rain on the off-chance that I might find a particular stick in a large wood. Sorry! Speaking of moving holidays, I think American Thanksgiving (late November) should be moved up to the same time as Canadian Thanksgiving (mid October) -- it's much more in the season of a harvest fest and it's not as close to Xmas! 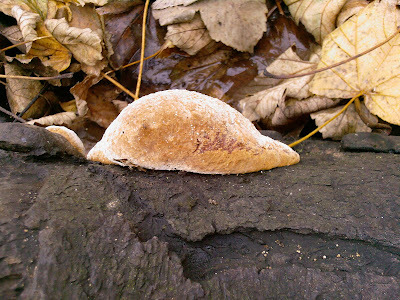 Also, you have such interesting fungi--one looks like a snail, one like a stuffed pancake, and one like a chestnut. Wow! Oh that is really cool fungus or whatever you call those(-: The slugus fungus looks just like a slug!! What a fun adventure(-: Glad you got pictures!! I've just got home from a walk and have found some more kinds - including some which look like very tiny dead piglets. I'm not striking too lucky on the 'pretty toadstools' this year! It is fun, this. I've been mulling over how small-minded it is, to go poking around in the woods when the world is full of wars and famines and other dreadful things . . . but I come home filled with something inside which is larger than when I set out . . . and it's so nice to know there will be people 'out there' to share the pleasure too. You ever seen the blob? This reminds me of that scary movie. Such a freaky looking thing. How odd. Thanks for sharing. Hello Rosy. I've not seen 'The Blob' but it sounds like a good name for several fungi. Not only that, they seem very much like science fiction creatures. Cool fungi photos. I can almost feel the damp. There's so much beauty in the woods, even when nothing is actively growing but the mosses & fungi. As well as feeling the damp, you need to imagine sound effects too. The winds have been so strong recently, walking through the woods has been like walking next to an aeroplane revving up. And today, when it has been calm, there's the sound of water dripping from stony ledge to stony ledge. I can't help but wonder how long it would take the fungi to break down the piece of wood into leaf mold-like substance. I have noticed here, that a limb I use for edging lasts about 3 to 4 years then it crumbles into a wonderful stuff that plants love. I know there are many other factors such as moisture. Isn't Nature wonderful to wonder about! You know, I was just thinking about your pink pearls post this afternoon. 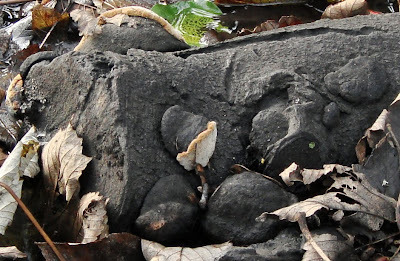 Isn't amazing the variety of methods nature has to decompose fallen trees? It's an interesting point because there are so many inter-related factors at work - including insects! Branches have fallen on top of the pink pearls and I can't see them through the mesh. I suppose I could tug the branches off (light and twiggy, not proper boughs) but I might just as easily knock the pearls from their perch as see the fungi so I've left things alone. I'll keep a watch on the spot though - it may not be the end of them!